The home-made batch of peas I made for John’s baby food are a hit! He totally loves them! He likes them WAY more than the store bought peas I had already fed him. They look much better than the store bought stuff too. Next on the list for baby food is green beans! I can’t believe Christmas is already almost here. Nathan was quick to remind me when I picked him up from school that there are only 5 days until Christmas. Nathan said he wants trains and Enterprises (the Starship Enterprise from Star Trek. Yes, the kid’s a trekkie!) He’s been milling around the Christmas tree, looking at the ornaments and even getting under the tree and staring up at the lights. I love him and I love how excited he is for Christmas! I can’t wait to see his sweet little face on Christmas day. Well, things definitely move slower when I don’t have a smart phone. It’s relatively easy to post pictures using it- I just use an app to add my watermark and can post it right then. But using a camera, as opposed to a phone, I have to go through the process of uploading the picture to the computer, editing it in Photoshop, saving it for web, and then uploading it to my blog. It makes me prone to procrastination, but hey, at least I got it done, right? So check out the abundance of cuteness we had going on! 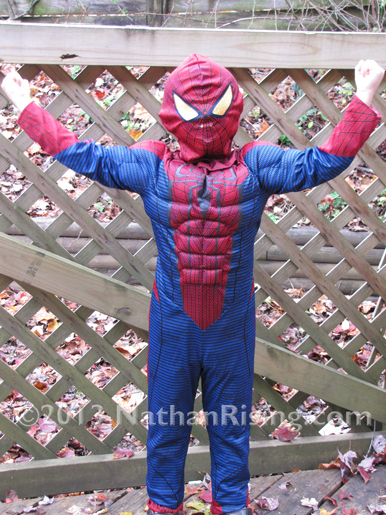 Nathan was very proud of his Spiderman costume. He picked out what he wanted to dress up as for Halloween, and he and Paul picked out the costume together. 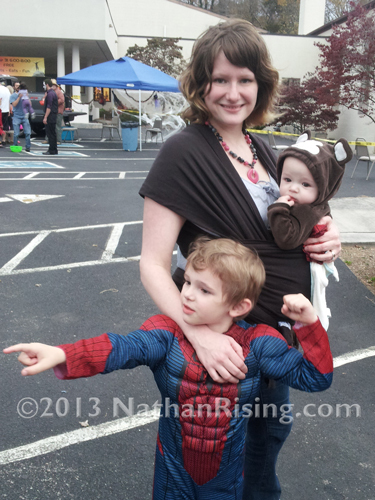 They even had trick-or-treating at his school, so Nathan got to wear his costume more than once. He was one happy little man! And my goodness, look at those muscles! Nathan was in mid-flex when he saw Captain America, so this is him pointing and exclaiming, “LOOK, MOM! THERE’S CAPTAIN AMERICA!” Too cute. John didn’t exactly get a say in his costume. 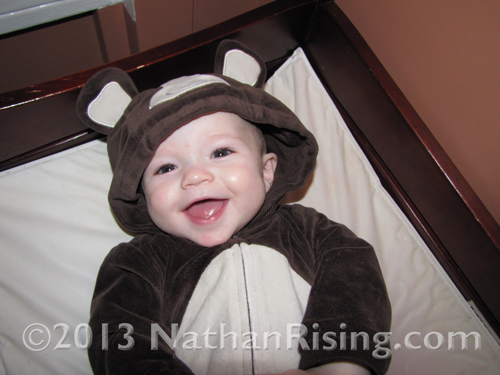 One of my sweet friends gave us the monkey outfit that her son wore last Halloween. It was so darn cute that I couldn’t resist dressing John up in it. What can I say? He’s such a little monkey that it suited him perfectly! Oh, and see the wrap I’m wearing? That’s compliments of my grandpa, my dad’s dad. It’s called a Moby Wrap, and I LOVE it. They’re usually a little pricey, but I was able to find a used one in excellent condition (as in, almost brand-new, even complete with the instruction manual) for half the price. Not too bad, huh? John likes to be carried, and the wrap distributes his weight evenly so my back’s not killing me by the time I’m done carrying him. I haven’t used that many different wraps and carriers to really compare them, but so far, I’m totally loving the Moby. And oh! See that lovely necklace I’m wearing? Paul’s mom got that for me. It’s called a Mommy Necklace, and it’s a really sturdy necklace made for moms of nursing babies. Or even babies that don’t nurse and just like to grab at things. John likes to pinch and pull at my clothing and even my poor skin while he’s nursing, and when he’s not doing that, his little arm waves around in the air like an antennae. So Paul’s mom came up with the idea of getting me a Mommy Necklace, and it’s perfect! Now when he’s nursing, his little arm will wave around in the air until it comes into contact with the necklace. And then he pulls, twirls, twists, and yanks on it the whole time he nurses. My skin and clothes are thanking her right now. It’s the only piece of jewelry strong enough that I can wear at the moment because of the baby and his grabbing hands, and I really love it! Look at that sweet face! He looks so much like his big brother, doesn’t he? John managed to go the entire time without crying. He really loved looking around at all the people. Nathan did super as well- we were so proud of him! We had such an awesome Halloween this year. We never did get any trick-or-treaters in our neighborhood, but that’s ok. Let’s just say the candy didn’t go to waste. Ha ha. Holidays take on a whole new meaning when you have kids, and I’m really, REALLY enjoying celebrating them with my little family. We took the kids trunk-or-treating at a nearby church this evening, and they loved it! Well, John liked staring at everyone around him and Nathan totally loved going from car to car getting candy. I was so proud of him because he also remembered to mind his manners most of the time by saying “Thank you! Happy Halloweeeeeeen!” after the candy was dropped into his bag. Nathan dressed up as Spiderman, and John was a monkey. A monkey is perfect for him because he is definitely my little monkey! We got a little bit of candy just in case we have trick-or-treaters at the house. We lived on a busy road at our old house, so we NEVER had trick-or-treaters. We didn’t even bother getting candy. But now, we live in a little neighborhood. Of course, trick-or-treating to different houses seems to be dying off nowadays, but what the heck. It doesn’t hurt to have a little candy, just in case. And if we get no one? Well, let’s just say the candy won’t go in the trash! I’ll post some pictures next time once I get them downloaded. Everyone have a fun and safe night!